Blackfriars. This area takes its name from the colour of the habits worn by the friars of a Dominican monastery who were known as the Black Friars. The monastery was established during the 13th century by the Earl of Kent, but was closed on the orders of Henry VIII in 1538. Part of the building later became the Blackfriars Theatre which was pulled down in 1665. The station is built on the site of Chatham Place which was named in honour of William Pitt, 1st Earl of Chatham. The station was opened as BLACKFRIARS on 30 May 1870. 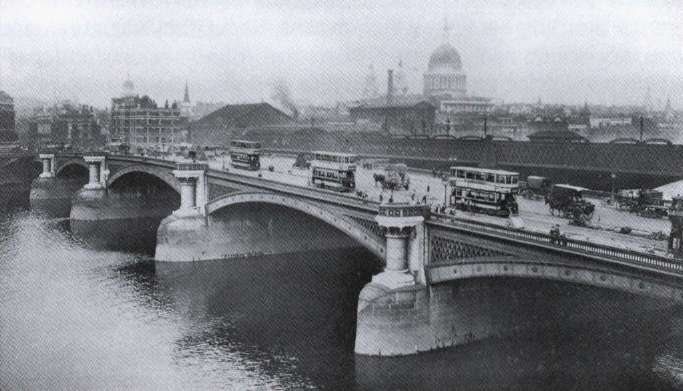 Blackfriars Bridge with the dome of St Paul's Cathedral in the background and Blackfriars South Eastern Railway station to the left of it. The District Railway's station neighbours it.